Anna Waldron (above) rehearses a scene from “Or,”, a co-production of theater companies Simple Machine and Maiden Phoenix. Like all small Boston theater companies, Simple Machine and Maiden Phoenix scramble to find affordable performance spaces. So they felt like they’d hit the jackpot when they landed the new black box in the Chelsea Theatre Works for their co-production of “Or,”. “Not to mention we are able to rehearse here, too,” says Maiden Phoenix’s Erin Eva Butcher. But more than economies of scale brought these companies together. 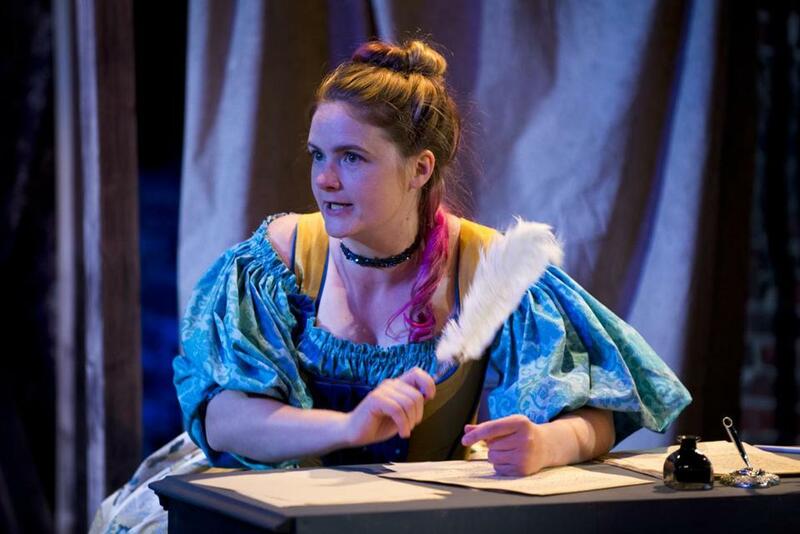 Liz Duffy Adams’s “Or,” explores the choices and ambitions of 17th-century playwright Aphra Behn, a woman who defied conventions and thrived, first as a spy for King Charles II and then as a popular, self-supporting playwright. The play has themes that fit the missions of both Simple Machine (whose artistic team consists of Libby and Anna Waldron, who are married) and Maiden Phoenix. “We are interested in strong stories told simply,” says Libby, while Maiden Phoenix focuses on stories written by and about women. A tale of a woman writing her own story, “Or,” had multiple layers of meaning for the artistic team. “The play is really funny, and has some farcical aspects, but it also manages to be modern and old-fashioned at the same time,” says director Adrienne Boris. While Adams’s script is set in the late 1660s, it also shifts to the 1960s and the present. Waldron says she is excited to play a woman who is open to possibilities. The decision to mount the co-production happened almost by accident, says Libby, adding that all the principals have known each other for years. Libby met Waldron when they both appeared in a production of “Cooking with Elvis,” and Waldron and Butcher appeared together in Maiden Phoenix’s recent production of “Sense and Sensibility.” Libby and Boris are connected through their work with Opera Boston. Although everyone on the creative team has plenty of acting or directing credits, for this production Libby is focusing on marketing, Butcher is designing costumes, while the others add producing duties to onstage work. Party debris litters the rehearsal playing space for Actors’ Shakespeare Project’s “Exit the King.” Eugene Ionesco’s bleakly comic drama, which runs Sept. 13-Oct. 8 at the Jackie Liebergott Black Box in the Paramount Center, imagines a kingdom at the edge of collapse, due to the neglect of an egomaniacal King Berenger. Confronted with the fact that the party is over, the king, played by Richard Snee, spends the next 90 minutes comically, and then desperately, watching his power, authority, and even his kingdom, disintegrate. Director Dmitry Troyanovsky says he is drawn to complicated texts, like those of Ionesco. Although “Exit the King” is considered the playwright’s masterpiece, Ionesco’s “The Bald Soprano” and “Rhinoceros” are produced more often. “We are not trying to answer questions so much as present these characters as flawed individuals and let the audience draw their own conclusions about their behavior,” Troyanovsky says. Everyone, no matter how powerful, must confront his or her own mortality. Over the course of the play, the king refuses to believe the truth, tries to bargain for more time, complains about the unfairness of it all, demands that his legacy be everywhere. “What was going to happen to him someday, is now,” says Snee. Wellesley College will host Actors from the London Stage for free performances of “Measure for Measure” Sept. 14-16 in the Dana Chapman Walsh Alumnae Auditorium. Five actors from a range of British theater companies will play multiple characters in Shakespeare’s tragicomic tale of justice and forgiveness. For more information, call 781-283-2000 or go to www.wellesley.edu/events.